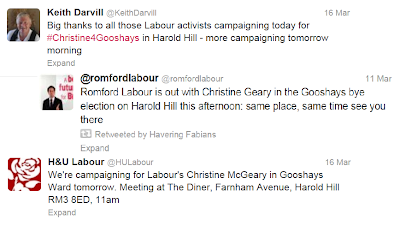 It’s been all hands on deck for Labour these past couple of weeks as they’ve been fighting to regain Gooshays ward after losing all three councillors in 2006, and regaining just one in 2010. 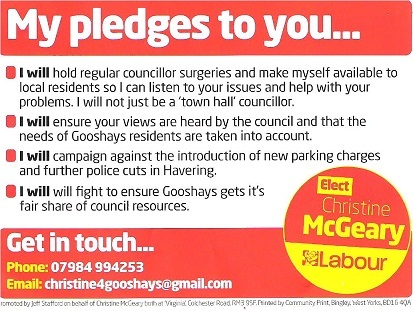 Christine Anne McGeary – the only woman to be standing in this by-election – is hoping to repaint the town red and increase the number of her party's councillors from 5 to 6. 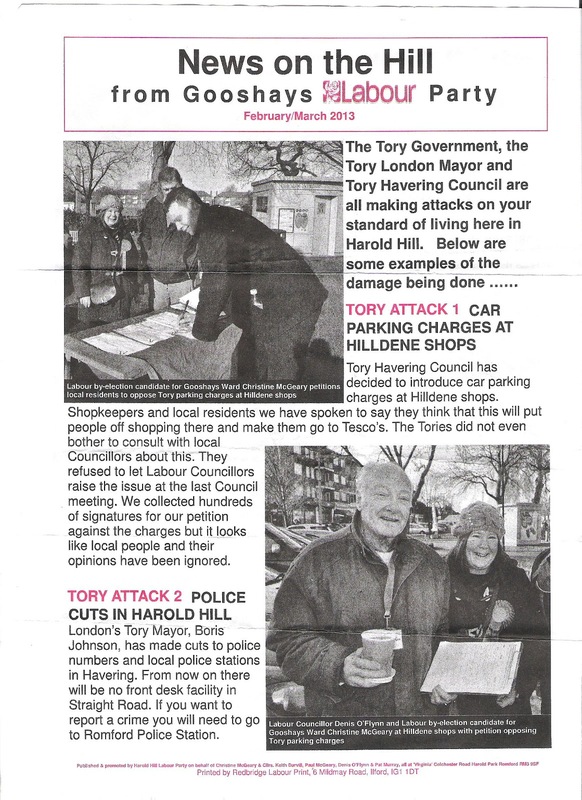 I was at the last council meeting where the ruling Conservative party refused to let Labour, the principle minority opposition, raise the issue of opposing parking charges at Hilldene, despite a petition with thousands of signatures. This is why - ironically - council democracy contains within it an undemocratic streak when the majority can ignore and dismiss the minority, even though all councillors are as democratically elected by the people as each other. On the other hand, Labour have been opposing cuts since the ConDem Coalition government came to power 3 years ago, and 3 years later their arguments are still as unconvincing. People have not forgotten how Labour mishandled our finances, including how Gordon Brown sold our country's gold reserves at a knock-down price. It’s all very well opposing the Boris’s cuts to the police, but I do wonder what Labour would do differently when it comes to cuts. 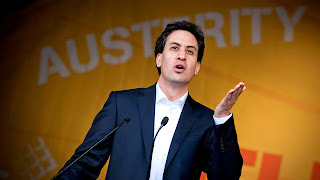 “Too far, too fast” is their all-too-familiar slogan describing George Osborne’s policy, but it’s cynical and dishonest when Ed Miliband marches alongside anti-cuts demonstrators knowing full-well he would have to make cuts himself if he was Prime Minister. Let’s also not forget Labour’s dismal mishandling of our borders. As it stands, the Home Office doesn’t know how many people are coming in and going out, and we’ve learnt this week that a quarter of a million extra school places will be needed by 2014 to meet the rising demand. And Havering council had grossly underestimated the population figures when 4 years ago it closed and merged local primary schools – including Manor school. When you vote on Thursday, just remember our legacy of 13 years of Labour government. This is how election literature should be! Her name is in big letters, she has a nice smile (if you're another candidate reading this, take note! 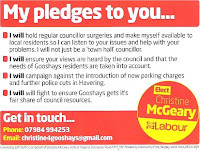 ), and her pledges are short, snappy and effective, especially for an audience which is probably turned off by politics. All other campaign leaflets I’ve seen from the other candidates (including Labour’s other piece of literature above) read like a party manifesto for War and Peace. Unless you’re a die-hard political anorak (like me), I very much doubt you have either the time or the will in your busy life to read through that amount of detail! 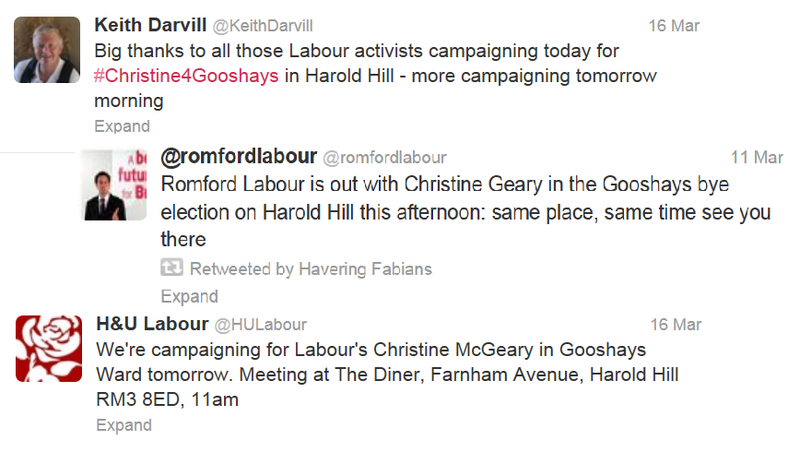 Social media has also played a big part in Labour’s campaign, where the other candidates have fallen behind. 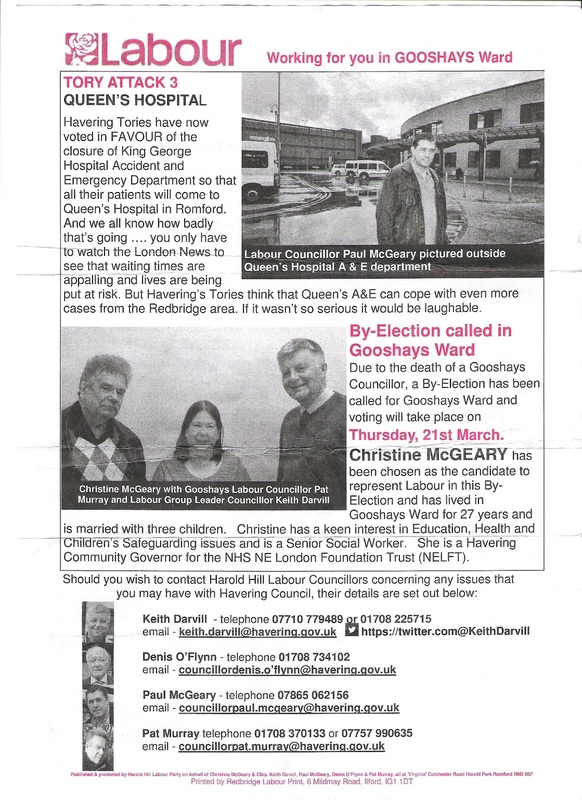 Cllr Keith Darvill, leader of the Labour group on the council, has used Twitter along with the official Romford Labour Party and other local activists to promote Christine’s campaign. In contrast, I know of at least 3 Conservative councillors who use Twitter, yet none have even mentioned their candidate Marcus Llewellyn-Rothschild or this by-election on their accounts. Maybe they’ve just given up? The only Residents' Association councillor I know who tweets is the leader of the RA group, Cllr Clarence Barrett (@clarence39533), and our Gooshays candidate Darren Wise (@darrenwiseRA) has also set one up (please follow both!). Like in so many other by-elections since the ConDems came to power, Labour have missed numerous opportunities to make political capital out of being in opposition. 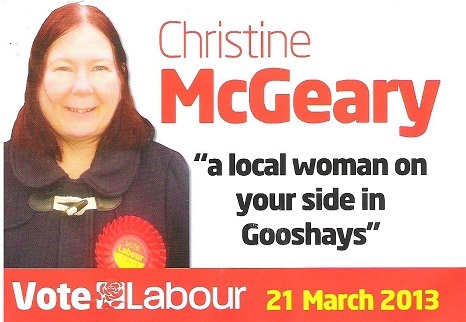 Christine’s reputation and hopes for Gooshays will be set back by her party's national record on the economy and immigration. In people's minds, she will be associated with this terrible record, and if voted in will join the relatively weak minority opposition on the council. A vote for Darren Wise, however, will strengthen the council's main opposition leading to a more effective scrutiny and challenge to the Conservatives. And whereas Christine will have to answer to a Labour party whip, the only people Darren Wise will have to answer to are the residents who elected him. I think it's too soon to be voting for Labour again. They have failed to convince me that they are worth placing trust in. Nationally, Labour have no plans of their own - they simply oppose the Government at every turn. It is this kind of unhelpful, party-political approach that has turned millions off politics (and off political parties in general). 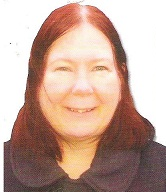 Christine McGeary may well have fresh ideas, but as Mr Donald has noted - she will have to answer to the Party whip. This is not to say that you should vote Conservative, though. The Conservatives probably retain the most undemocratic party structure at local level. Although the Conservative Policy Forum has been established to give local Conservative activists a stronger say in the formation of policy, it is uncertain how far Party elites really take note of this (the same is true of Labour). The Liberal Democrats have a more democratic Party structure - yet they also have a reputation for utilising some rather unscrupulous tactics in local elections. Personally, I would have as much confidence in a Lib Dem promise as I would in a chocolate teapot. The Residents Association are probably decent characters - and presumably there is no kind of 'whip' in place. But the charge of 'NIMBYism' often hangs over such groups. The extent to which they are able to take a long-term view for the good of the whole community (rather than just having their particular area or street in mind) remains to be seen. As for UKIP....they're barking mad.